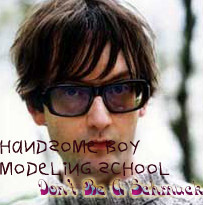 HANDSOME BOY MODELING SCHOOL: Don't Be A Schmuck The new album from Chest Rockwell and Nathaniel Merriweather, finally ready for 2002! Featuring the following highly educational tracks, sure to keep you from acting a fool with your woman! 18. Making Friends With (Alcoholic) Beverages feat. Ed O.G. ...and additional vocals by Damon Albarn of Blur and Gift Of Gab of Blackalicious. ...and additional instrumentation by Flea of Red Hot Chili Peppers, Chris Vrenna (aka Tweaker), Nicky Wire of Manic Street Preachers, Terranova, and Courtney Taylor of The Dandy Warhols. Some geeky types write fan fiction based on movies, television shows, and comic books. That's not me. I like music. So why not design a fake album?! As Prince Paul and Automator are taking their sweet time with the followup to 1999's awesome Handsome Boy Modeling School album, I've found myself wondering who will be featured on the next joint. I already read that Thom Yorke and Damon Albarn are supposed to be on it (interestingly I couldn't find a reason to include Albarn as I've already had enough of him on the Gorillaz, Deltron 3030, and Lovage albums). But who else? I decided to just jot down some names of artists I'd like to see on the next album. I enjoyed the first one so much that I thought it was just a given that I'd naturally have a lot of repeat guests. So I decided to not bother with repeating Del, Sadat-X, Kid Koala, DJ Shadow, etc., and just write down new names (sorry it took so long to put this online). Most of the song titles I came up with on the spot. They don't really mean much of anything. Similarly, the album cover I just whipped up in two minutes. It's just Jarvis Cocker from Pulp. The name of the album is also not very important to me either, I can't fathom what the next album would be called since it's kind of an isolated concept. Here's what's practical about what I came up with: Trent Reznor was supposed to be on a project with Automator, Prince Paul and Mike Simpson (of the Dust Brothers) in 1999 called "The Good, The Bad & The Ugly". For whatever reason, this never came out. However, Trent's a big fan of hip-hop and I think he'd work well with the two, whether he's co-producing or just singing. As for all the Warp artists, Automator must know at least some of them because he knows Mark Bell (LFO) and has worked with him on the Deltron 3030 album and an upcoming project. And if he knows Mark Bell, Mark Bell knows Björk. Prince Paul has worked with Last Emperor and MC Paul Barman before. The Coup and Anti-Pop Consortium are on Automator's label, 75 Ark. Poe I emailed personally and told her she should be on this album. Here's what's impractical about what I came up with: Did you notice it's just a bit... vanilla? That's because most of my favorite emcees (those that I think would actually sound good over a Prince Paul/Automator beat) were on the first album. I came up with what I could in the hip-hop department. There's a lot of singing on this hypothetical album, which is unrealistic. Even more unrealistic is the outside production. Automator and Paul are great producers, they don't really need any help. However, I thought of a few collaborations that would sound good. Obviously the album wouldn't realistically have so many outside producers, but I think each collaboration would be nice in itself. Lastly, there aren't enough skits here for a Prince Paul project. Anyway, if you were amused or intrigued, please email me with your comments (especially if you're a musician I like, say hi). I hope you enjoyed this "sneak preview" of the new album, hitting stores in a few short weeks! Hurrah! A few months after I made this page (which was discovered by Esthero via Google and emailed to Automator himself by a longtime musician friend) I thought of some new songs which I like a lot. Some of these replace or cancel out what's above. I'd also add James Poyser and GZA somewhere. The first song would be hilarious, no question. The second song would be an all-out war of crazy singing voices. I tried to get this idea to Jill Scott but I didn't get a reply for some reason. :) My reasoning for this song is that they all have lots of range and have sung in some strange voices in the past. By the time you read this, you may have heard the actual second album or read the details. Interestingly, my ideas for Chino Moreno, Cedric Bixler, and Cat Power were all used. Whether it's influence or coincidence, I'm not sure, but I'm glad.